I’ll never forget when my family was cleaning out my late Grandfather’s house after he passed. I found an old band-aid tin that was full of a variety (in both style and age) of small multi-bladed slip joints. They were all he carried and on most of them one blade was worn down to a nub, whereas the rest were shiny and like-new. He was a true EDCer, he didn’t think about the concept of carrying things like I do, he just made sure he had what he needed. A traditional knife was always included. Slipjoints, or traditional knives, have seen a bit of a resurgence in the last couple years with the knife community at large. So much so that you see dedicated slip joint knives being made by brands like Spyderco, Benchmade, and Lionsteel. Handle Materials: “Frontier Bone” handle scales, I think this is just a form of cow bone, but I’m not sure. I’ve owned a handful of GEC’s knives over the last few years, even been able to get my paws on some of their much sought after Tom’s Choice (or TC by the cool kids) special factory runs. So, when I got the Oregon Trapper in hand I was struck by one thing right off the bat, this knife is large for a slip joint. I was, obviously, aware of the size when I ordered it. The specs were clearly listed on knivesshipfree.com but it wasn’t until I got the knife that I realized exactly how big it is. Now, depending on where you fall in the slip joint community that could be a good thing, or that could be a bad thing. As a tactical knife carrier in recovery, I dig the larger size. I think it’s easy to feel, “under-gunned,” for some reason when you’re carrying a small slip joint knife by itself, but this Oregon Trapper dispels that feeling. GEC’s chosen steel is the venerable 1095 high-carbon steel. 1095 is like a bowl of vanilla ice cream when it comes to knife steels. It’s really all ya need, but there’s nothing really special here. It’s high-carbon, so it will take and hold a fine edge very well, but it will also stain and rust if you let it. To add onto that, there is also a whole “sub-culture,” that forces patinas on their blades, and I have to admit, a well-done patina (or a naturally formed one over a long period of honest use) looks really, really nice. The steel thickness on the GEC starts at 0.113” and is ground to a blistering 0.018 before the final edge. There are sharp knives, and then there are “sticky” sharp knives where when you lightly touch the edge your skin sticks to it. This knife is the latter. As I stated earlier the handles of the GEC 43 Oregon Trapper are made from a material GEC calls it’s “Frontier Bone,” which is a vaguely frightening term that makes you think of bleached buffalo bones in a sandy Arizona desert landscape, however, the truth is less menacing. Frontier Bone is a portion of light cow bone that’s burnt or toasted, and then polished. 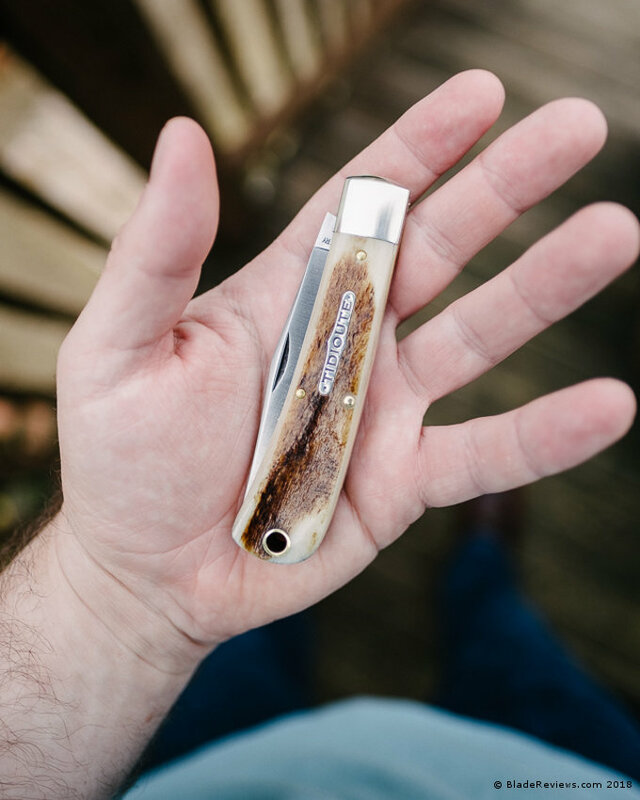 I think it looks pretty cool and is generally cheaper and easier to find compared to something like stag or jigged bone handles. The one catch with GEC’s (and really all traditionals) is that these type of bone handles can vary greatly in thickness. Looking straight down at my example shows that the right-hand scale is slightly concave, whereas the left is convex. So that will always be a gamble with this particular handle material, something like micarta will not have this issue. The handle shape itself is simple, straight back with a slight swell and negative angle at the tail. This allows a solid purchase in hand but doesn’t have any choils or jimps to provide texture. It terms of carrying the GEC 43, I use a leather pocket sheath. knivesshipfree.com include their own branded buffalo leather pocket slip, that I used for a while. I have a custom pocket slip made by a friend of mine that carries a slipjoint and a Muyshondt Maus. Due to the fact that the knife is a bit larger than your normal slipjoint it may not work with all your carry methods, but it seems to work well with these. I generally suggest some sort of pocket organizer to keep the knife vertical in your pocket, there’s nothing worse than knife sitting sideways in your pocket. Lastly, the action. Slipjoints are measured on a scale of 1-10. 1 being the blade having zero resistance on it from the spring, and 10 being it needs the screaming He-Man strength to open it. Most GEC’s are a 6-7, they have a stronger pull than I like, but are usable and manageable. The Oregon Trapper clocks in at a solid 5, nice and smooth action with a pinch-able blade. I found the walk and talk to be a little spongey, but there is still a good positive half-stop and audible snap when closing/opening. Once opened the knife is solid and doesn’t have any movement side to side. For a production, this is perfectly acceptable. So, would I suggest this to someone else? Sure, if what you want is a larger slip joint that could serve as your only EDC knife. I think the decision to transition from a locking folder to a slip joint as part of your EDC is one that takes some consideration. I would personally say that non-locking folder of any sort is more of a lighter-duty knife. So if you’re in law enforcement, construction, fire fighting, etc – I think that you’d need to think long and hard about what the lack of a lock would mean on your knife. If you’re like me and you work in an office, and primarily open mail, packages, and cut food with your EDC knife, this is an obvious choice; and a great way to introduce some variety into your EDC rotation. As always our preferred source of everything sharp is either from knivesshipfree.com or bladehq.com both of which have this particular Great Eastern Cutlery 43 Oregon Trapper in stock. Editor: I recommend purchasing the GEC 43 Oregon Trapper at KniveShipFree or GPKnives. Please consider that buying anything through any of the links on this website helps support BladeReviews.com, and keeps the site going. As always, any and all support is greatly appreciated. Thank you very much. I have a small confession to make. Though my articles may not reflect this, I have a crippling addiction to Great Eastern Cutlery knives. For every modern knife in my collection, there’s a traditional knife (often in matching or complimentary colors), and I fear it won’t be long before the old timers actually outnumber the fresh blood. The latest addition to my little menagerie is the Great Eastern Cutlery #66 “Calf Roper” in olive drab canvas micarta. It’s far from perfect, but at the same time it’s often the first traditional knife I reach for before leaving for work. You may be asking yourself why I don’t review Great Eastern Cutlery products more often. The problem with reviewing their knives is twofold: one, they sell out quickly, and two, all of their knives are produced in batches. If a run of their knives is sold out, it may be years before they make another version; even if they do, there’s no guarantee that they’ll use the same blade configuration or handle materials. So before we get into the meat of the review, a word of advice: if you’re interested in it, go buy it. You can finish the review afterwards. The Great Eastern Cutlery #66 “Calf Roper” weighs 2.57 ounces and measures at a hair under 3.5 inches in the closed position. This particular version of the #66 has three blades: a clip point blade 2.5 inches long, a sheepsfoot blade 1.9 inches long, and a spey blade 1.8 inches long. If the #66 had just a single blade and weighed this much, it’d just be average, but as it packs three blades into the frame it’s nothing short of fantastic. Of course, if those blades never get used, they might as well not be there. The clip point is the easiest to justify: it’s popular on single and multi bladed traditional knives alike. It offers plenty of straight edge for push cuts, but has enough belly to be the all-star of a picnic lunch. Consider it your go-to blade for most tasks. The utility of the sheepsfoot blade is similarly obvious: a short, straight edged blade is perfect for opening packages and breaking down boxes. Really, the only inclusion that I haven’t found an explicit use for is the spey blade. It’s fine as a pen blade, but otherwise is just a holdover from days when animal husbandry and horticulture was more common. I’m a junkie for thin grinds, and the Calf Roper delivers that in spades. All three blades start as thin stock and are brought down to a fine working edge. The grinds are clean and even, though the cutting bevel itself is pretty narrow. While I don’t have any complaints, apparently enough people do that there’s a robust market for reground GEC knives. The #66 features 1095 steel on all three of its blades. 1095 has been a staple of American cutlery since the early 1900s, though now it’s seen primarily on traditional pocket knives and large fixed blades. It’s a carbon steel, so without care it will rust, but there are steps that can ward that eventuality off. You can clean the blade off after use and keep it well oiled; or (my preferred method), you can use your knife on a lot of fruit and produce and let it build up a protective patina. Edge retention on the #66 is passable. Great Eastern runs their 1095 at a Rockwell hardness of 57-59, which is a bit harder than the steel on Victorinox (Swiss Army) knives. In practical terms, this means that any blade getting regular use should be touched up on a leather strop two or three times a week. If pressed into work cutting cardboard or other abrasive media, more care will be required. The #66 “Calf Roper” is listed as a Serpentine Jack; to be honest, I’m not entirely sure why. Given the blade configuration, most companies would list the #66 as a Stockman variant. My suspicion is that A.G. Russell cornered the market on the “Serpentine Stockman” quite awhile ago…but that’s just speculation. Regardless of the nomenclature, the handle is pleasantly simple. It’s a simple cigar shape with a subtle curve. Nickel silver bolsters pair well with the brass liners, both of which are given a brushed finish. A plain oval shield ties it all together. As this is Great Eastern, it should go without saying, but the handle is immaculately constructed. Using my fingernail, I can hardly tell where the bolster ends and the micarta begins. If you follow me on social media or have read past articles of mine, you might have guessed that I have a small fixation with micarta. It is – bar none – my favorite handle material. Why shouldn’t it be? It’s light, strong, grippy, and has an organic quality rarely found in G10. The olive drab micarta on the #66 is perfectly implemented, left just rough enough to have some texture, but still smooth enough to not feel out of place on a traditional knife. Of course, if micarta isn’t your thing, the #66 is also available in ebony, acrylic, stag, and two variants of jigged bone. Sadly, the ergonomics aren’t as good as the handle would suggest. While the handle shape is great, the sheepsfoot blade adds a sharp hump right where your fingers go if you’re using the clip point or the spey blade. Neither of those blades causes a similar problem when the sheepsfoot blade is in use. It’s not a crippling issue; you’d have to be gripping the handle pretty tightly to generate real discomfort. All the same, I can’t help but wonder how much better the #66 would be if the spey blade was removed so the sheepsfoot blade could ride lower in the handle. At a closed length of 3.5 inches, the #66 is one of the most pocketable knives produced by Great Eastern Cutlery. Between the serpentine handle shape, the generously chamfered edges, and the modest size, it’s easy to carry the #66 however you’d like. It’s a touch large for smaller coin pockets, but only just. I carry mine in a leather slip, as I do with most of my traditional knives. A slip distributes the weight more evenly, and prevents the knife from rolling to the bottom of your pocket and generating discomfort. Is it necessary? No, but I’d recommend giving one a shot if you haven’t already. There’s no two ways about it: compared to modern folding knives, any traditional knife is going to be less convenient to pull out and use. Before I can actually use my knife, I have to pull the slip out of my pocket, pull the knife out of the slip, put the slip down (or back in my pocket), and then use two hands to open whichever blade I need. In the office or around the house, those extra steps aren’t an issue. When I’m in the field, I want quick, convenient access to a blade that I know won’t close on my fingers if I torque it in a weird way. I still carry a traditional at work, but only so I have a knife on me that I know won’t frighten anyone. There’s no grit in the action, and the blades snap crisply into place, whether in the open or closed position. None of the blades have any side-to-side play or worrisome wiggle. The pull on the clip blade is about as strong as it is on a Swiss Army Knife, while the spey and sheepsfoot blades only need about half as much effort to open and close. A half stop would be a welcome addition, but isn’t a necessity. Even accounting for the vestigial spey blade, the funky ergonomics, and the lack of a half stop, the Great Eastern Cutlery #66 is a personal favorite of mine. It’s handy, pocketable, and beautifully finished, with subtle touches of modernity that grant it a timeless appeal. The only competition that comes to mind is the aforementioned A.G. Russell Serpentine Stockman, but I don’t know if that comparison is entirely fair. The Serpentine Stockman is a fine knife – I owned one – but it’s larger and made with cheaper materials. Between the two, I’d pick the #66 every time. If traditionals don’t interest you, I don’t know if this should be your first. Single bladed traditionals are often a better way to test the waters. That said, once this run is sold, it’s unclear when Great Eastern will produce another run of the #66. If you like the design, or even think you might like the design, pick one up. They’re easy to sell on the secondary market should you be disappointed. Clearly, I’m not. I recommend purchasing the Calf Roper (and any of its derivatives) at KniveShipFree. Please consider that buying anything through any of the links on this website helps support BladeReviews.com, and keeps the site going. As always, any and all support is greatly appreciated. Thank you very much.